Dominique and Cindy Duby are celebrated pâtissiers and chocolatiers, innovators and authors. Their striking desserts are legendary, as is their seemingly-boundless creativity. The husband and wife team have been the subject of critical acclaim and lauded with countless awards for their culinary achievements. With such an awe-inspiring resumé, I was nothing short of honoured when they agreed to (virtually) sit down with me for an interview via e-mail. Our conversation took place just before the release of their third cookbook, a study of crème brûlées - both sweet and savoury. seven spoons: First off, the obvious question; why devote an entire book to crème brûlée? DC Duby: Actually, it is our publisher who asked us to write a new series of books on single topics and this is the first one/topic. 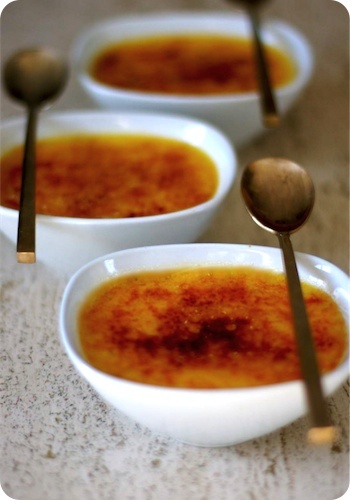 Crème brûlée is actually is really easy dessert to make for the home chefs but it also offer us, as chefs/authors, with a great challenge to be creative and expand on this topic. We believe that we offered some classics, but also a lot of new ideas, info on the creative process (flavour pairing), some of the science behind custard, et cetera. So this book is more than just basic recipes. 7S:Innovation seems one of your hallmarks; referencing classic pastry recipes, but reimagining them. Where do you find your inspiration? DCD: As you mentioned, classics are the basis of our inspiration and we try to 'construct' (a constructivism approach is one of our basis for innovation) from there. DCD: As always, any ingredients that can expand the palette of traditional pastry making, we want to try it. We love using vegetables and/or herbs and spices in our sweets. 7S: You are known for pushing the boundaries of pastry, often employing an arsenal of scientific techniques in your repertoire. In fact, sections of your online boutique read like a chemistry textbook.How do you find a balance between technique and ingredient? What comes first in the development of a recipe? DCD: We sell Elements which are culinary ingredients; you are right to say that they are chemicals but then you would have to call salt and sugar as chemicals as well! So we prefer that people refer to our Elements as specialty ingredients for modern cuisine, just the same way that starch (modified or not) became a new specialty ingredient used to thicken sauces instead of flour. As well as a cookbook, we want our site to be a boutique where [people can] buy products and also a site to get information We will have a lot more recipes posted in the new update next month as well as culinary videos to demo culinary techniques. [In regards to the question of technique], we think that people sometimes seem to forget that a freezer was a very novel tool in its time. Liquid nitrogen was used by ice cream makers in the US in the early 1900, yet some people think that this a recent culinary innovation. We work with scientists all the time and they are always quick to point out that there is not that many new ideas in food science, just new ways of thinking. To answer your question, technique and ingredient are in symbiosis - if you have a great ingredient but apply a poor cooking technique (conventional or modern), the result will be mediocre and vice versa with a great technique applied on a poor quality ingredient. The design process for us is twofold; like scientists, we bring forth a hypothesis for a new dish or chocolate and first is flavour combination then it is texture. 7S: Your aesthetic is quite modern, minimalist and yet impactful. How do you approach presenting a dish or designing a confection? DCD: We always tell chefs, why spend an already overloaded work day with making time consuming sugar or chocolate decors that most patrons will just put to the side and not eat? Time would be much better spent on the dish itself be with better ingredients, novel techniques, et cetera. 7S: Often you will hear chefs and cooks separate what they cook professionally, and what they cook in their own kitchen. What is the typical dinner (or favourite dinner) for two pastry chefs at home? What five pantry or refrigerator staples do you like to have stocked at all times? Culinary speaking, [Dominique] trained as a 'savoury' chef first and [Cindy] only trained a sweet chef. Typically, unless we are doing research, we will not eat or make a dessert at home. But we do cook everyday and are very concerned with nutrition. 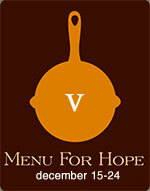 We love using the pressure cooker, great meals in no time. We have three of them and two induction stoves so we can have a great healthy meal prepared in very little time. It would be culinary death for us if we could or would only have five ingredients stocked at all times. We have lots of dry spices (garam masala, star anise, cinnamon, ancho and other chilies), Asian sauce bases like hoisin, lots of fresh herbs in our garden (parsley, basil, rosemary, sage, tarragon), and we always have a lot of vegetables from different alliums, roots like carrot, fennel, potatoes, and what ever else is available at the farmers market that we shop as at least twice a week like eggplant, savoy cabbage, parsnip. Not too much protein though except for fish. 7S: And finally, three questions in one. What is your favourite celebratory dessert? DCD: A great carrot cake turn into a birthday cake is far better for us that a pretentious or badly executed multi-layer cake with rubbery mousses, dry biscuit bases, et cetera. DCD: We love chocolate and most derivatives of it. Depending on the season, we make ice cream or sorbet in our Paco Jet - fantastic. In the fall and winter, we love a pie made of pate sucrée filled with an almond cream and baked topped with pears or apples. When berries are good, a crispy puff pastry with vanilla pastry cream and fresh strawberries is great. DCD: Great food with great wines. A sincere thank you to Dominique and Cindy Duby for taking time out of this interview. 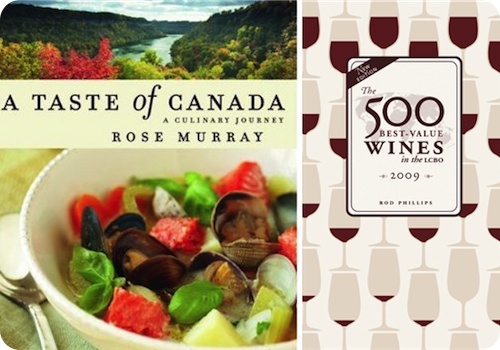 My snapshot review of their new book, Crème Brûlée (Whitecap, 2008), will appear as part of my look at a selection of Canadian cookbooks from 2008 - keep an eye out for it next week.